New England Patriots star Tom Brady may need to make room in his trophy case for not just his most recent Super Bowl ring, his sixth, but for his kids’ trophies, too. Brady, 41, opened up to ABC News’ Michael Strahan about the athleticism of his three kids and the sport he is trying to get his only daughter to play. Brady revealed he is trying to get Vivian, 6, to play hockey but Bundchen, a native of Brazil, does not approve. “As a parent, we just want our kids happy,” he said. 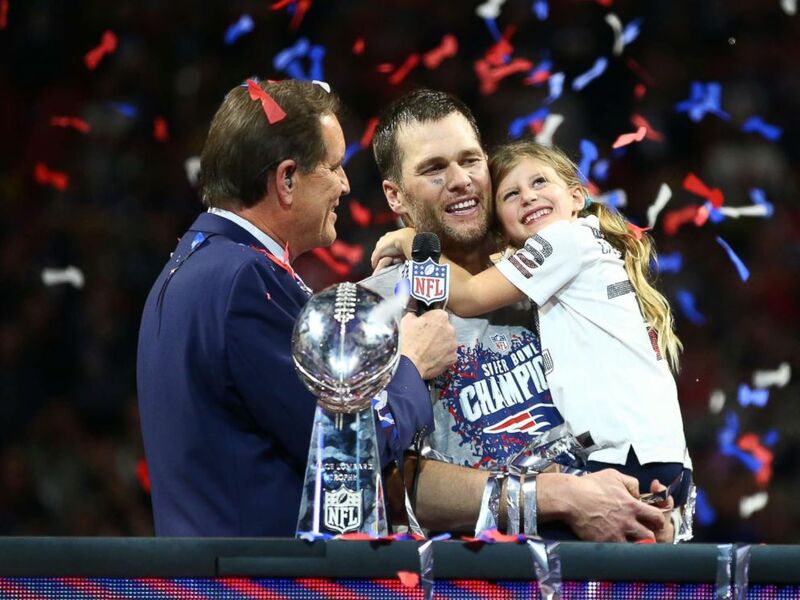 New England Patriots quarterback Tom Brady (12) and daughter Vivian celebrate as they are interviewed by CBS host Jim Nantz after Super Bowl LIII against the Los Angeles Rams at Mercedes-Benz Stadium in Atlanta, Feb 3, 2019. “Football success is one thing, you know, being a good dad, being a good husband, being a good friend, that’s really important to me, too,” Brady added. Brady’s entire family was by his side in Atlanta as he led the Patriots to their sixth Super Bowl win. He called the experience both “emotional” and “great” for his family. Tom Brady of the New England Patriots kisses his wife Gisele Bundchen after the Super Bowl LIII against the Los Angeles Rams at Mercedes-Benz Stadium on Feb. 3, 2019 in Atlanta. “[Bundchen] was holding him most of the game but it was just a great experience for our family,” Brady said. “She loves seeing everyone like Jules [Julian Edelman] and Gronk [Rob Gronkowski] do well. All the guys that have been around for a while,” Brady said.